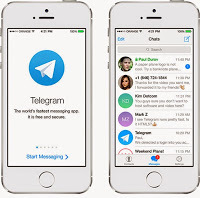 Telegram messenger is the direct competitor to whatsapp messenger and if you take a look and compare the two apps closely, you will notice that Telegram is actually better than whatsapp. The only reason while it seems that whatsapp is better is because many people are not aware of Telegram. In fact, some people don't even know that something like that exists. You can check this 8 reasons why Telegram is better than whatsapp remember that telegram now allows 5000 group members instead of the former 1000 allowed as of last year. Telegram v3.9.0 features some few changes which includes message editing, name mentioning of any member and addition of chat shortcut to home screen. => You can mention group members just as its done on facebook and twitter but in this case you will type @ before the person's name and the person will get notified. => Your edited messages will be marked with 'edited' tag. This lets members to know you changed something from the original post. Where Can I Download Latest Telegram App? For iPhone and iPad users, download latest telegram app from itunes and enjoy the new features.